Experience the beauty and natural wonders of iconic Cape Town; get up close to animals in their natural habitat; and explore one of the “Seven Wonders of the World.” Spend three nights in Cape Town, discovering its many treasures with visits to Cape of Good Hope, Boulders Beach and Table Mountain. You also have a choice to visit the renowned Cape Winelands, or tour famous Robben Island. Next, fly to Kasane, Botswana and cross the border to Namibia to embark on your Chobe River safari cruise through the wondrous Chobe National Park, home to one of Africa’s densest populations of wildlife. Encounter elephants, giraffes, leopards, zebras and buffaloes on excursions by boat and open-air vehicles. 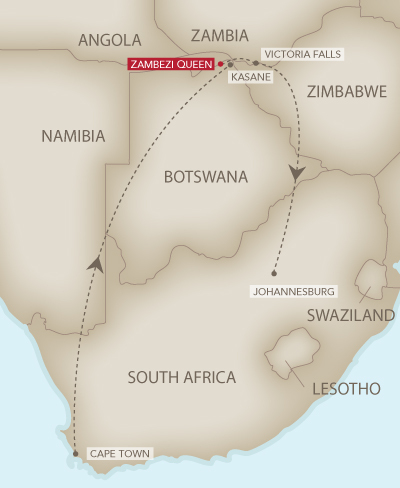 Conclude your journey with two nights at the majestic Victoria Falls. You also have the option to extend your trip in Johannesburg, following in the foot-steps of Nelson Mandela. Intra-Africa Air: $1,595 per person including taxes and fuel surcharges.